A few years ago I made the switch from mono to braid. I ran straight braid on all my reels for a while but then I read an article on using braid as backing and mono as your mainline. That was the invention of the top shot. I have 3 setups that I use with mono top shot. I have my shark setup, my grouper set up and I have my live bait set up. A few advantages to using mono topshots are the extra abrasion resistance compared to mono, the ability to have a little bit of stretch which helps fight fish and the cost of mono is 5 times less than braid. 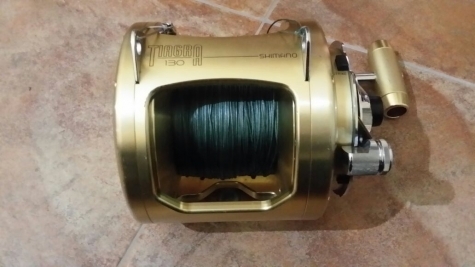 My shark setup is a Shimano Tiagra 130w on a Barret Custom Shark rod. I have 1000 yards of hollowcore and 750 yard of 130lb mono as my topshot. I have only used this set up about 2 times and after every 3-4 big sharks I like to replace my mono. My grouper set up is Okuma Solterra 50W with an Okuma Makira 7'6 XXH conventional rod. I use it for pier grouper fishing and bottom fishing. I have 300 yards of 50lb braid and a 200 yard topshot of 100lb bullbuster mono. I change my line out after 10 fish due to the fact I'm fishing so close to the structure. My live bait set up is a 8ft St. Croix Tidemaster XXH spinning rod with a Shimano Saragosa SW 10000. I have 250 yards of 30lb Bullbuster braid and 100 yards of Bullbuster 20lb mono. This helps add the give I need while fighting big fish as well as giving me more abrasion resistance to horse big fish from the bridge pillings.